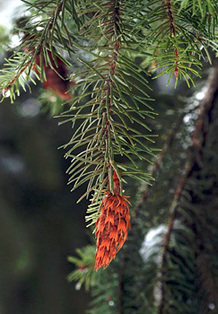 Douglas firs have more than 38,000 genes, roughly twice the number in the human genome. So any gene that has helped those trees survive extreme drought, heat and disease has been passed down through generations of seedlings. "I think of them as the ultimate genomic pack rat," said Richard Cronn, a research geneticist at the Forest Service's Pacific Northwest Research Station. "They save everything, and they have been saving things for millions of years. You never know when you are going to have to pull something off the shelf and use it." Forest Service researchers are in the midst of teasing out which of those genes help Douglas firs and 39 other species of plants, animals and pathogens found in Western forests adapt to climate change. Armed with that information, managers could select more robust seeds to replant forests destroyed by fire or disease, or propagate those seeds to help conserve a species. The genetic code of a single Douglas fir tree contains twice as many genes as the human genome. Scientists are trying to determine which of the tree's 38,000 genes have helped the species withstand stresses such as drought, disease and climate change. Photo courtesy of BLM. "Finding genetic markers for things that help confer adaptive benefits in high temperature -- that could make the difference for something like whitebark pine," Cronn said. So far, geneticists have sequenced more than 40 billion base pairs (the two nucleotides that join the two strands of DNA or RNA together) from 130 samples of species like tan oak, sugar pine, sagebrush and fishers. That is more than 12 times the amount of information in the human genome, which has about 3.3 billion base pairs. The massive undertaking, known as the Western Forest Transcriptome Survey, is a collaboration between the Pacific Northwest, Pacific Southwest and Rocky Mountain research stations and four universities. A "transcriptome" is the collection of genes an organism is expressing at any given point in time, reflecting its response to environmental cues like stress. While DNA is fixed, RNA is the active part of genes that make proteins to carry out functions as they are needed. Whether a gene's RNA is turned on or off, and to what degree, is highly dependent on environmental factors and changes all the time. By seeing what genes have active RNA under different conditions, like emerging from dormancy or high temperatures, geneticists can figure out what genes play a role in those processes and responses. The Forest Service has long been interested in learning plants' ideal climate zones. For almost a century, foresters have tested how different subspecies respond to climate by gathering seeds from different places and planting them in one spot, known as a common garden, and observing how well they adapt to the new environment. However, these experiments are costly and take years to produce meaningful results. They also do not reveal the genetic mechanisms behind those adaptations. "If we knew the genes that were responsible for that trait ... we could screen seedlings at an early stage to say, 'Do they have the particular suites of genes we want to be able to put on a particularly stressful situation?'" Cronn said. "We wouldn't have to run those garden trials." It has only become feasible to analyze the huge genomes of plants in the past few years thanks to a revolution in genetics and computer technologies. Massive parallel sequencing machines can read millions of snippets of gene sequences at a time, and powerful computers can process all that data and piece it together. Massive parallel sequencing has been used for important crop species and what scientists call "model" species -- such as mice, flies and humans. But this is the first time the technology is being applied to a broad swath of wild organisms considered economically or ecologically important in Western forests. 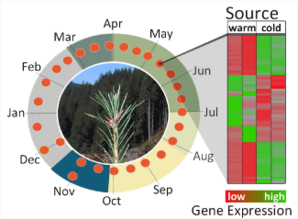 As part of the Western Forest Transcriptome Survey, researchers have identified more than 200 genes that behave differently in warm-adapted versus cold-adapted trees as they emerge from winter dormancy. Genes showing high expression are indicated in green, while genes showing low expression are shown in red. Graphic courtesy of Richard Cronn, USFS. Jessica Wright, a geneticist at the Pacific Southwest Research Station, is studying sugar pine to see how different populations adapt to climate change. She collected needles from three pines planted within 7 feet of each other that were originally from California, Oregon and Mexico, and sequenced their expressed genes to see how they react differently on a molecular level to the same environment. Within the 4 billion base pairs she has sequenced for sugar pines may be some clue as to how one particular tree is able to survive better in a warmer climate than another. "We won't be able to say, 'It's the gene for climate change! Yea!'" Wright said. "We will have a narrow set of genes that are interesting and candidates for future research." Wright is also sequencing genes from tan oak that has been inoculated with the Phytophthora ramorum pathogen that causes sudden oak death, and will compare them to genes of uninfected oak. Through this survey, Wright found leaf tissue of the infected oaks contains the genes of both the tree and the pathogen. This enables her to study how the two species interact and what tan oak genes are turned on or off in the presence of the pathogen. Sudden oak death has killed hundreds of thousands of trees in California. Wright anticipates studying this relatively new pathogen will provide insight into how disease spreads and how that may change as the climate warms. "We need every tool to understand this problem and massive parallel sequencing expands our understanding of it in a new way," Wright said. Bryce Richardson, a geneticist at the Rocky Mountain Research Station in Provo, Utah, is sequencing the transcriptome for three subspecies of sagebrush, a dominant shrub in the West that provides vital habitat for the endangered sage grouse. The subspecies are difficult to tell apart and often interbreed -- "it's a taxonomic mess," Richardson said. Studying the plants' genomes will help botanists clarify the subspecies' geographic boundaries and adaptations for their particular environments. This information can be used to plan for future climate scenarios. "The manager might say, 'We should go out and collect more seed from this population and put it in long-term storage or help seeds move up in latitude so as the climate warms it will be adapted to that particular habitat,'" Richardson said. Michael Schwartz, a geneticist at the Rocky Mountain Research Station in Missoula, Mont., has sequenced the transcriptomes of 40 fishers, medium-sized carnivores found warranted for Endangered Species Act protection but precluded from listing in the Rocky Mountains and Pacific Coast. The fisher transcriptome survey has revealed some surprising insights about the animals, which could influence how they are managed. Previously, geneticists have identified distinct mammal populations using a section of RNA about 300 base pairs long. Based on that section, the northern and southern fisher populations in California were thought to be the same, possibly indicating they were once connected. Conservationists have called for reintroducing fishers into the central part of the state to re-establish connectivity. However, the more thorough transcriptome survey, which included 16,000 base pairs for each sample, revealed the two California populations are actually distinct and were likely isolated from each other thousands of years ago. The northern population also appears to have many more adaptations to its local environment than other groups, though researchers do not know what those are or why that is the case. "We were missing a big piece of the puzzle," Schwartz said. "We should be careful about introducing individuals from the North to the South because the isolated bioregion has been there." Discoveries like this -- ones that completely upend what scientists previously held to be true -- are likely to become more frequent as genetics technology continues to take huge steps forward every couple of years, Cronn said. "It's kind of dizzying in a way," he said. "I don't see the pace slowing down at this point. It means our ability to answer complex problems will improve dramatically with every year that goes by."